On weekdays, your internal body clock is great and can save you in times your alarm decides not to go off in the morning. On weekends, however, it can really kill your plans to have a luxurious sleep in, even if you go to bed much later than you normally do. This is exactly what happened last weekend when my friend I returned home after dancing away in the city and decided to set our alarm 8 hours from when we were going to bed, a time which was hours after the normal time we would normally wake up for work (okay yes, it might been a double digit hour). I figured since we were giving ourselves only 8 hours of sleep, our bodies would abide but no we were wide awake at breakfast time so we decided to do brunch instead of our planned lunch. That did leave us unsure of where to go because our plans of Mexican or Italian didn’t quite work with the time of the day. 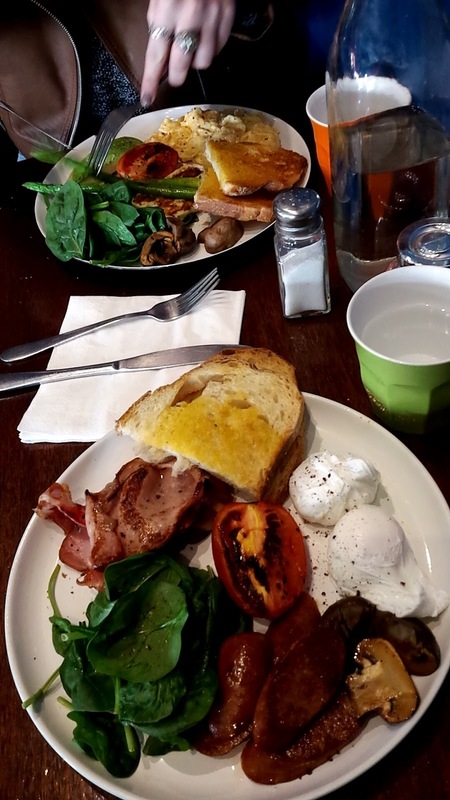 By the time we reached Newtown we decided Google could help us decide and I literally Googled “Best Brunch in Newtown” and found VargaBar Espresso, a café we hadn’t heard of but had some good reviews. Tucked in a street behind the busy King Street, the little café would be easy to miss if you weren’t looking for it but the fact that it was full seemed like a good sign (as was the delicious smell it was omitting). And I mean little, the café is tiny and it’s a little bit squishy but luckily when we arrived a few of the tables cleared. Despite the size of the café, the menu was quiet extensive and had lots of tempting choices but I decided to go with the Varga Big Breakfast (I had been hungry since 2am!). A big plate with a generous helping of bacon, salty butter bread (I had a choice of several different breads and chose sourdough), mushrooms, eggs (I decided to go with poached), chorizo and rocket. Nothing overly fancy but totally what I needed. My friend got the vegetarian version of the big breakfast that had haloumi and avocado instead of bacon and chorizo. We were both really satisfied and were glad to have discovered this little hidden café (thanks Google!) and are already keen to go back to try there other options.